I study ecosystem involving atmosphere-biosphere interactions, soils, snowpack, and plant physiology. I do this primarily with the eddy covariance technique at the GLEES AmeriFlux site in southeastern Wyoming where I am quantifying the changes in ecosystem fluxes in response to a spruce beetle epidemic. I also study the uncertainty in the eddy covariance with sonic anemometry and through Bayesian statistical analysis. 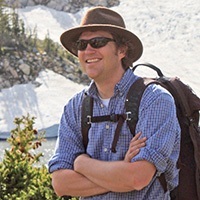 As an ecologist I have interests in micrometeorology, eddy-covariance, subalpine forests, spruce bark beetle, Bayesian statistics, stable isotopes, plant physiology, sublimation, environmental physics, and soil physics. The engineer in me appreciates electronics and instrumentation, sonic anemometry, data analysis, signal processing, non-linear filters, and wavelets. I am an electrical engineer and have previously worked in soil physics evaluating methods of measuring soil moisture in eastern Kansas croplands. Basinger J.M., G.J. Kluitenberg, J.M. Ham, J.M. Frank, P.L. Barnes, and M.B. Kirkham. 2003. Laboratory evaluation of the dual-probe heat-pulse method for measuring soil water content. Vadose Zone Journal. 2:389-399. Heitman, J.L., J.M. Basinger, G.J. Kluitenberg, J.M. Ham, J.M. Frank, and P.L. Barnes. 2003. Field evaluation of the dual-probe heat-pulse method for measuring soil water content. Vadose Zone Journal. 2:552-560. Within the context of climate change, understanding the fundamental interactions of an ecosystem is critical for predicting future forest conditions. The eddy covariance technique provides unique and invaluable information about processes underlying the exchange of energy and mass between the atmosphere and biosphere. For example, our research following a spruce beetle epidemic was instrumental in linking changes in plant physiology, ecosystem water use, and the forest carbon sink. In recognition of the paper entitled 'Climate control of terrestrial carbon exchange across biomes and continents"
Reed, David E.; Ewers, Brent E.; Pendall, Elise ; Frank, John ; Kelly, Robert . 2018. Bark beetle-induced tree mortality alters stand energy budgets due to water budget changes.